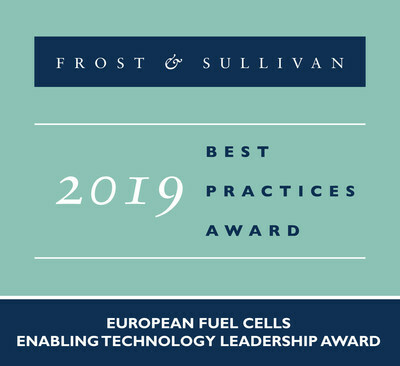 LONDON, Jan. 29, 2019 /PRNewswire/ -- Based on its recent analysis of the European fuel cells market, Frost & Sullivan recognises GenCell Ltd. with the 2019 Europe Enabling Technology Leadership Award for its fuel cell solutions that provide clean backup and off-grid power to utilities, healthcare, telecommunications, and automated industries. Using an alkaline electrolyte, such as potassium hydroxide in water and non-platinum electrodes, GenCell can offer advanced, yet affordable technologies. Fuel cells can be a game-changer for many appropriate markets by both reducing costs and achieving sustainability. GenCell has two backup power products, the GenCell G5 Long-Duration UPS, and the GenCell G5rx. GenCell designed the G5 to deliver backup power for long periods to mission-critical applications that cannot be adequately served by short-duration uninterruptible power supply solutions. On the other hand, the G5rx provides immediate power to utility substation automatic circuit reclosers and is capable of handling lightning strikes, surges, or objects getting stuck in power lines until the grid becomes operational again. In addition to fuel cell power benefits, the G5rx specifically meets the unique requirements of utilities, including their substation energy profiles and safety and seismic standards. Designed and built from the proven G5 platform, GenCell recently launched the A5 off-grid power solution to supply primary power to users beyond the grid. The A5 incorporates a unique technology that overcomes current hydrogen infrastructure limitations by creating hydrogen-on-demand from ammonia. It is the world's second most-produced inorganic chemical, with more than 200 million tons of ammonia produced each year and distributed globally via pipelines, tankers, and trucks-making it readily available and inexpensive. As a result, the GenCell A5 significantly reduces operating costs compared to diesel generators. "GenCell's technology overcomes the obstacles that have historically prevented mainstream fuel cell adoption. Importantly, it developed many patented technologies to reduce the capital and operational expenditure for its fuel cell power solutions," said Manoj Shankar, Senior Research Analyst at Frost & Sullivan. "Some of these solutions include employing a non-platinum catalyst, establishing mechanisms for applying ambient air as an oxidiser, and introducing lower-cost fuels, such as industrial-grade hydrogen gas or anhydrous liquid ammonia." Alkaline fuel cells (AFC) are among the most efficient types of fuel cells, achieving up to 60% electrical efficiency, and up to 87% efficiency when used as a combined heat and power system. AFC is the only fuel cell technology to utilise the hydrogen produced from cracking ammonia. Liquid ammonia is an excellent carrier of hydrogen for the GenCell fuel cell generator, giving it a significant competitive advantage over other fuel cell solutions. As ammonia is cheaper than diesel in all but a few countries, GenCell's A5 off-grid solution for the underserved rural segment is available at running costs of $0.50 kilowatt hour (kWh) to $0.75 kWh, which is two to three times lower than the running costs of diesel generators. "Furthermore, by using a liquid electrolyte, potassium hydroxide, GenCell's alkaline fuel cell solutions boast a freezing temperature of negative 40°C, which enables them to work in both warm and sub-freezing conditions. In comparison, other membrane fuel cells hydrate their membranes with water and must operate above 0°C or be placed in a heated and insulated enclosure," noted Shankar. "Overall, these significant product benefits and sophisticated technologies position GenCell's products for wider application across industries." Each year, Frost & Sullivan presents this award to a company that develops a pioneering technology that not only enhances current products but also enables new product and application development. The award recognises the high market acceptance potential of the recipient's technology. GenCell Energy fuel cell solutions offer affordable, clean power for humanity that renders diesel generators obsolete. Using the ultra-reliable technology that powers American and Russian spacecraft, we deliver backup power for utilities, homeland security, healthcare and automated industries. Our revolutionary process to create hydrogen-on-demand from anhydrous ammonia (NH3) enables our fuel cell solutions to provide primary power for off-grid and poor-grid telecom, as well as rural electrification. GenCell Energy has more than 80 employees, including many veterans of the Apollo and Mir projects. The company is headquartered in Israel with a worldwide distribution and support network and has unique intellectual property that includes patents, trade-secrets and know-how.